Youngest USAC HPD Champion in History and Only Driver to Ever Win the “USAC HPD Triple Crown” with Overall, Dirt, & Pavement Championships in 2017. He defends his 51FIFTY Junior Late Model Championship in 2018 with 51FIFTY on the hood of his Late Model Toyota Stock Car. 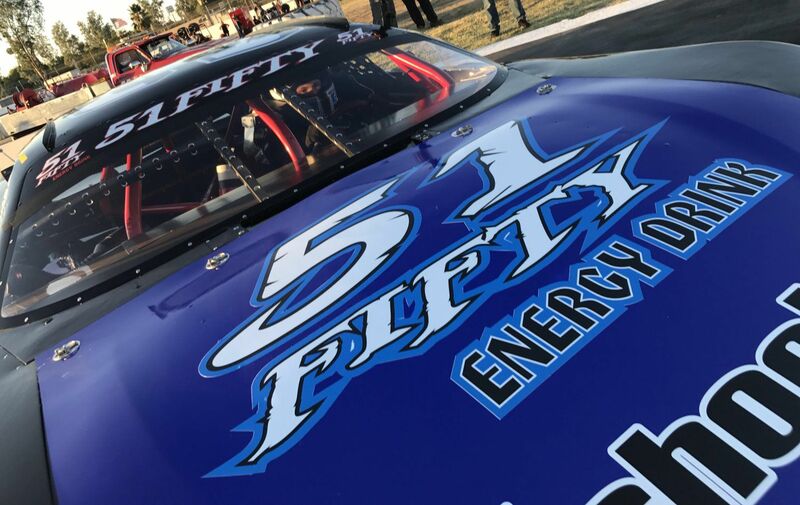 MENLO PARK, Calif., March 9, 2018 (Newswire.com) – ​​​​Love Motorsports is pleased to announce that Jesse Love Racing has inked a multi-year partnership with 51FIFTY Energy Drink. “We at 51FIFTY Energy Drink are excited to have Jesse Love back on the 51FIFTY team for 2018. Jesse has clearly demonstrated a dedication and passion in racing. He had an amazing season with us on the hood in 2017 with five wins in eight races and the Championship. We also like working with Jesse since his talents cross over into many divisions of motorsports. He ran four different cars last year in four different series across the United States and took the Championship in all of them. That type of passion and dedication exemplifies our brand – he takes risks, he pushes the limits, and he doesn’t back down,” states Sarahfina Perry, Brand Manager 51FIFTY Enterprises. Toyota Racing Development Driver Jesse Love, of Menlo Park, California, started racing quarter-midgets at the age of five and he hasn’t looked back since. He racked up multiple State and National Championships in Quarter Midgets of America before the age of 10. Last year, in addition to winning five out of eight races and the Championship in the 51FIFTY Energy Drink Junior Late Model Series that was televised on MAV-TV, he also won the United State Auto Club (“USAC”) Western Overall Championship for USAC Western Focus Midgets by capturing the USAC Dirt Championship and the USAC Pavement Championship, the first driver to do so in a single year. After wrapping up his regular season, Jesse headed out to the desert states to compete in the Silver State Road Course Series with INEX Racing at the famed Las Vegas Motor Speedway Road Course. In his inaugural full season with the series, Jesse took another five wins out of the eight-race series, winning the last three in a row to capture the Championship. This final Championship win took Jesse to four out of four Championships in 2018. We at 51FIFTY Energy Drink are excited to have such a talented young driver on the team. Jesse Love has shown his dedication and passion in racing and that’s what truly caught our eye. Can’t wait to see how far we go together. 51FIFTY Energy Drink located in Livingston, California was borne out of one man’s desire to chase his dream. At 51FIFTY, we believe that everyone has the opportunity for greatness. The Energy Drink company is committed to giving back through its many racing programs, including “Race for Autism,” an autism awareness campaign. Since the beginning, a percentage of every can of 51FIFTY Energy Drink sold has gone toward the Carlos Vieira Foundation, a 501(c)(3) nonprofit organization dedicated to helping families living with autism. To date, over $800 thousand has been donated.